Posted in: General Market Thoughts. Tagged: $SPX, $TRAN, AAPL, Symmetrical Triangle. $TRAN is the leader. No question. While it’s nice to see the Q’s being pumped to the moon lately due to high expectations for AAPL’s earnings, if the transports roll over then so will the other indexes. You can see on the chart below several indecision doji’s in the last three sessions. Could prove to be totally meaningless as $TRAN is well above all MA’s with the 20MA about to cross up through the 200. $TRAN is also well above the rising trend line and closed out the week above its late October closing high. IMHO, the chart does look good but I have seen the transports tip their hand so many times in the past that it needs to be watched next week. You can also watch $DJUSAR, which looks like it’s trying to put in a bottom, and $DJUSMT which is exhibiting the same kind of indecisiveness as $TRAN. The thing about $SPX is that it took it four weeks to rise from its October low to its October swing high of 1292.66. Ten weeks have passed since then and still no new rally high. But we are close so maybe next week. To me the weekly chart looks good but not great. On the weekly chart I think it’s very important for the 26MA to turn up and then cross up through the 52MA. That whole process will take several weeks but it can’t start until the 26MA stalls, which hasn’t happened yet. Well, you can’t always get what you want. I’ve drawn in a rising price channel to replace the symmetrical triangle. Certain to be some wild swings in the markets next week on earnings. Be careful and be extra krispy careful trying to front run on the short side. Posted in: General Market Thoughts. Tagged: $NYSI, $SPX, Stealth Distribution, Symmetrical Triangle. Starting in the 60min time frame, you can see on the chart below that SPY broke down out of a bear flag pattern. This could just be a big head fake but it will be important for SPY/$SPX to get back inside the rising pattern and then take out the most recent high or risk getting a sell signal when the 13 crosses down through the 34 EMA. Back on the last trading day of 2009 I remember watching as one of the Big Boyz started to unload and this unloading triggered ‘sell’ programs from every corner and the market plunged into the close. This was a concern and I wondered if the selling would continue on the first day of trading for 2010. It didn’t, but about two weeks later the markets fell off a cliff and stayed down into the second week of February. Key to that particular decline was a very obvious pump in the first week of January that made no sense and then a couple of signs of stealth distribution. Will history repeat? Probably not, but there’s always a chance it will get close. The daily chart looks okay, though there are a couple red flags. Even so I don’t think it would be wise to read too much into the daily chart given last week’s low volume action. However, if weakness and indecision are not replaced by strength and direction next week, then trend lines run the risk of getting tested and/or broken. $SPX did manage to make a new intra-day high on Tuesday and also managed to close at a new monthly high on the same day at 1265.43, exceeding the previous closing high of 1261.01 from 12/7. $NYSI weekly chart showing a bullish Sto X. If you look back at other times when there was a bullish X on the Sto, you’ll notice that the markets and the $NYSI rose for more than a couple of weeks after such a X so it is possible that the markets could move higher into earnings, as I opined last week. ‘Course I was wrong about the possible short squeeze this past week so good chance I’m wrong about a rally into earnings, as well. $NYSI daily chart showing a fresh ‘buy’ signal as short term MA’s cross up through one another. It’s important now for $NYSI to rise to and above 500 in a show of broadening market participation. Longs would not want to see the daily $NYSI turn and give a ‘sell’ signal before it reaches 500. Weekly $SPX chart showing it still dealing with the symmetrical triangle and crawling down the upper trend line. The fact that the 13MA has crossed up through the falling 26MA is bullish but is not nearly as bullish as the last time this happened back in October of 2010. Still, this has to be taken at face value for now until proven otherwise. The markets continue to be difficult to read. While we have moved up off the October lows, we have not been able to rise back above either the early November or late October highs and this leaves market direction in question. At some point in the future the market will reveal itself but who can say when that will be. In the meantime, be careful. Posted in: General Market Thoughts. Tagged: $SOX, $SPX, IWM, QQQ, Symmetrical Triangle. On the 60min chart that I put up on Friday, I noted that the RSI on the chart was above 70 and that one can usually expect some kind of consolidation period or pull back when the RSI rises above 70. The RSI on the 60min charts of XLF and DIA also rose above 70 so these, too, are showing overboughtness and may need a little time to cool off and digest recent gains. Other than mutual fund managers and market makers working the market higher on Friday, I really have no idea why the Dow would have added 124pts and better than 1%. Even so, I have to expect some kind of Santa Claus rally/short squeeze next week. Next week should see light volume and one way to pull in more volume is to engineer a short squeeze, because it is all about turnover. Market markers, brokerage firms, clearing houses, etc cannot stand the buy-n-hold crowd because they don’t make any money on transaction fees if people buy a little here and there but don’t intend to sell. So this group can steer the market where they think they can generate some turnover and transaction fees, and that would be higher for now. Shorts probably have their stops set just above 1267, 1277, and 1292. If the mad men at the helm can push $SPX into these levels, then shorts will scramble to cover. And with the $SPX now up a whopping 0.6% on the year, a nicely engineered rally into the 1290’s would mean a yearly gain of around 3% and that might be enough to stem the tide of outflows from mutual funds that are draining equity based mutual funds. I would love to see a nice Santa Claus rally next week and would love to see $SPX rise up close to or above 1300. It’s only 35pts so why not? The rally might even last a little bit longer into the first week of January. Generally speaking, the best time to be in the market is from October through the March/April period as we all know that the Big Boyz sell in May and go away, or so the saying goes. This year could be different due to earnings that by some accounts are expected to be less than stellar. AA reports in the second week of January and if the chart of AA is any indication then it doesn’t look too good for them and if AA does in fact disappoint, then that could set the tone for the remainder of earning’s season. In the meantime, we have two key sectors that are underperforming the major indexes, and one key sector that has been underperforming of late: $RUT, $SOX, & $NDX. The $RUT is down about 4% on the year, the $SOX is down about 10% on the year, and while the $NDX is up around 3% on the year, chart wise it is in trouble, with the 9EMA still below the 20MA and with $NDX still below the 50 & 200MA’s. So watch these in the week ahead because any rally will need to include all of these and $RUT/IWM really does need to lead. This week’s chart shows $SPX pushing through and closing above the symmetrical triangle pattern. Except for Wilder’s ADX, everything else is moving upward. I don’t know if the 13MA can cross up through the 26MA this week since it’s only going to be four sessions, but if it should then that would have to be seen as a positive for $SPX going forward. To me, the chart looks neither bullish nor bearish because it’s so difficult to tell whether $SPX is moving up, down, or just sideways. I think we will have a clearer picture by this coming Friday. I’m going to be following this daily chart next week and will be watching the 200MA for a northerly turn and for previous swing points to fall by the way. If the market should pull back instead of moving higher, then, if the market is truly headed higher over the next couple months, the rising trend line should halt any such pull back, or famous last words. Posted in: General Market Thoughts. Tagged: $SPX, Symmetrical Triangle. The 60min SPY chart below shows that the 13EMA remains above the 34EMA so SPY, and therefore $SPX, remains a ‘buy’ or a ‘hold’ for now. I feel it’s legitimate to redraw the trend line as long as the 13EMA stays above the 34EMA for SPY or any other stock, ETF, etc. The uncertainty early in the session caused the 10,7,7 Sto to have a bearish cross and so this was a warning but by the end of the day SPY pushed up and closed green, and that’s all that matters for now. The daily chart of $SPX showing that it is now just a few points away from tagging or breaking the falling trend line. Should be a piece of cake, right? Yeah, well maybe. But since $SPX has banged into that falling trend line about 14 times over the past few months and failed to break above it then you just have to wonder if this is the time. Interesting that today’s candle is a Hanging Man and that could be a reversal candle. Confirmation that the candle is truly a reversal candle would come tomorrow or Friday with a close below today’s low of 1229.51, otherwise it’s just a candle. The bottom line is that if the $SPX is ready to rumble then some imaginary line on a chart isn’t going to stop it from going higher and breaking above this imaginary barrier and this should easily happen this week and really should happen tomorrow, IMHO. If $SPX takes too long then the enthusiasm will wane and selling will take over again. While the two lines drawn on the chart clearly outline a symmetrical triangle, I still consider the top line to exert all the authority to date so that is why I am kinda’ ignoring this pattern in the daily, though the weekly is another story. There are two types of traders that continue to watch this market from the cheap seats. That would be those who trade the daily charts only when the ADX line manages to cross up through the -DI line, and those who trade using the weekly charts. Back in December 0f 2010, with the $SPX around 1180, the ADX line crossed up through the falling -DI line in a ‘buy’ confirmation. Less than two months later, with the $SPX above 1300, the ADX line fell and crossed back down through the +DI line generating a ‘sell’ signal per this method. The ADX line and the DI lines have waffled back and forth since then but have yet to give a fresh ‘buy’ signal. Traders following this strategy would be mostly if not totally in cash. For weekly chart traders, a fresh entry was generated back in late October of 2010 when the short term MA’s began to cross up through one another with the $SPX trading close to 1100. These traders would have held until late July of this year when the short term MA’s began to cross down through one another at a time when the $SPX was trading right around 1300. Traders who employ this strategy would also be mostly or totally in cash waiting for the next ‘buy’ signal. And we’re not there yet. Daily chart of $SPX with back to back inverted hammers. I don’t know what to make of this. Indecision? Triple witching BS? Mix-n-match? One thing I do know is that the falling trend line continues to exert its authority. At the same time, $SPX has now closed below all the MA’s on this chart for the past three sessions. The 5,3,3 Sto is now turning up and so there is a chance that the bounce that began this past Thursday will continue, or famous last words. Weekly chart showing $SPX moving toward apex of symmetrical triangle. It could take 2-3 weeks for $SPX to hit the apex and break one way or another. In the meantime there is always the chance that $SPX may need to test the bottom line which would be just below 1200 now. $SPX rose 10pts in the previous week and then fell 35pts this past week on higher volume. $SPX was off by 2.83% last week and is now off 27pts and 2.19% on the month. This does not look like a happy chart and even if we do rally next week, it will still take several good weeks to turn the weekly around. It just seems to me that the market is moving without much interest, that new money is avoiding the markets for now and until that changes then we’re just going to keep headed sideways to down. There is the expectation that pre-holiday trading will be done on light volume and will favor the upside, but that was not the case going into Thanksgiving. The paranoid will survive this market while many of the froth-mouthed bulls and bears will fall by the way. Posted in: General Market Thoughts. Tagged: $NYSE, $SPX, $TRAN, $TRIN, 4 Week New Highs/Lows, 90% Up Day, Daily $NYAD, Symmetrical Triangle. I think the moral of this story is that at the time it becomes clear that the market is headed in one direction you should be prepared for the market to change course. Or as Joe Granville is credited with saying, “The obvious is obviously wrong.” And I guess that now that those Euro fellows have let the cat out of the bag and things in Euroville are only going to get better from here, then obviously we should all be prepared for a mega Santa Claus rally, right? Of course. Friday was another 90% up day with a $TRIN close at .66. $NYDNV went into extreme oversold territory while the daily $NYAD and $NYADV went into extreme overbought territory. If this happened on any day other than a Friday, I would probably say that we could expect a pause day in the following session. But, since we did this on a Friday then news is probably going to be more important come Monday. The following indexes produced very obvious spinning top candles on their respective charts. The biggest problem with the following is the Transportation Index because of its underperformance. Spinning tops after a long white candle just mean indecision and that’s nothing new, but the fact that $TRAN underperformed and then produced a spinning top in the weekly time frame is note worthy and so the Transportation Index needs to be watched closely next week. One thing about $TRAN is that at turning points it often produces several small doji’s in the daily time frame, and then rolls over. Weekly chart of $SPX is showing what looks like a spinning top doji, while SPY in the weekly time frame is showing what looks like a hanging man candle. So obviously there is some indecision in the weekly time frame for the $SPX and even more obviously there is certain to be trouble brewing for the SPY, but then the obvious is so obviously wrong, or so they say. We’re just going to have to see how this goes next week. I’ve drawn in a symmetrical triangle on this chart and that upper line should be in about the same place as the upper line I’ve drawn on the daily charts the last couple of days. The $SPX could break out of this pattern any time it wants but it could also meander along for about 3-4 more weeks until it reaches the apex. The 26MA, which has been dropping since July, looks to have stalled this last week and so it finally might turn in the week ahead. The 13MA, which rose by about 8pts last week, is about two weeks away from a Bullish X of the 26MA. The 200MA on the daily charts, which is almost in the same place as the 52MA on the weekly chart, has proven to be a barrier in the last week. A break above this area would have to be seen as bullish and an indication that the $SPX wants to go higher. If $SPX can break above these MA’s, then 1277 can’t be too far behind. The $SPX crawled along the bottom side of the 200MA for the past five sessions and that has to be seen as weakness so in the week ahead $SPX is not likely to crawl along but instead is either going to break through or get repulsed and pull back. Posted in: General Market Thoughts. Tagged: $SPX, 90% Down Day, NYUPV, Symmetrical Triangle, TNA. My suspicions confirmed. At least so far. What we witnessed over the previous few days was nothing more than covert distribution and today we finally saw overt distribution. I don’t think this is the end of the distribution. The markets once again went into extreme oversold mode with $NYUPV dropping to 27.20 and 97% of today’s volume going into declining issues. In the past couple of months we’ve seen back-to-back extreme oversold days so don’t be surprised if we get another one tomorrow. Well, that is unless those Euro fellows come out with a major positive plan. 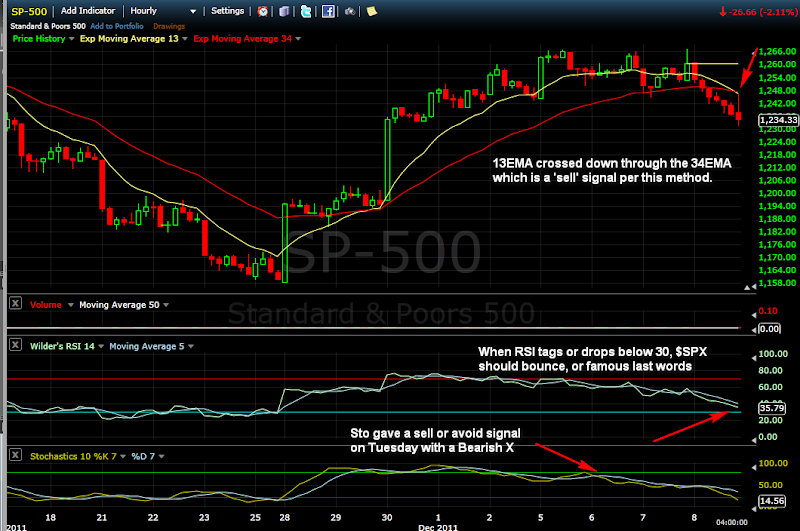 $SPX gave a sell signal in the 60min time frame today when the 13EMA crossed down through the 34EMA. Interesting that back on Tuesday the Sto had a bearish X. That Sto is now oversold but it may stay that way until the RSI dips down to the 30 area. Because I don’t think we’re anywhere near being out of the woods, I doubt either the 20MA or the 50MA will offer any kind of support in the next few sessions. For all I know we could be headed back to $SPX 666, but just don’t know it yet. Unfortunately, Wilder’s ADX, which started to break down yesterday, is now turning bearish so I think any hope of an ADX bullish X of the -DI line is out the window. I’ve put the symmetrical triangle back on the chart because the $SPX really never really did do much after clearing the upper trend line and now has fallen back inside the pattern. Bulkowski says that the first break out of this pattern is often a false break out and that looks to be the case here. If this really is the case, then we may be headed back for a test of the rising trend line, now around 1180. I sold all my TNA today. Here is a chart that does not look good for the $SPX, at least as of this moment. This large falling price channel would be negated the moment that $SPX closes above the 1277 level. Until then, the $SPX is at risk of running all the way down to the 1158 level. The high to the left of the chart is the July high. The lines are not exactly parallel, as they should be in a channel, but that may not be important at the moment. What’s important is that $SPX has been contained within this falling channel since late October and nothing says it can’t drop down to the lower trend line. Not a prediction. Just sayin’.